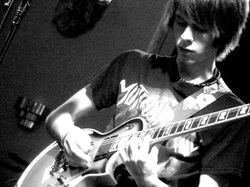 A former student of Bella Angel Music himself, Filip Latocha is classically trained on guitar, bass and piano, along with being university-trained in music theory, composition, sound recording technology, and the mastery of perfect pitch. While attending Guerin Prep High School, he received four years of classical music training in the string orchestra, two years in the jazz ensemble playing both guitar and bass. He has also played in the symphonic and marching band as an upright bass player. He also studied piano for several years with Bella Angel Music owner Ellen Bartolozzi. He is currently studying Computer Science at DePaul University, and studies classical voice and music theory. Filip currently plays guitar in several Chicago-based rock and metal acts which have been active in community events and shows, some of which have received recognition in Park Ridge and Elmwood Park's Pioneer Press. He is also the former bass player of the string quartet Synchronicity, as well as a session musician for We Make Good Records. His most recent work can be found on his YouTube channel, where he displays his musical abilities and interests. His musical tastes and abilities have no limits, but his strengths lie in the rock music, the melding of dense chord selections from jazz and the intense, yet precise, rhythmic playing of metal.